Lloyd Wayne Bridges and Margie Lee Johnson met, fell in love and married in a small church in Guthrie, Oklahoma and then set forth in their young lives. Although graduates of the Oklahoma School for the Deaf, they would in time call Texas their home and their path would ultimately lead them to Austin. Through life long friendships and a passion for serving, the Bridges would help to change the culture of injustice and oppression toward deaf and hard of hearing individuals in Texas. This is their story and it is our history of how Texas became the model for equal access and deaf rights. Lloyd and Margie began the legacy of what is now known as 3 Bridges. 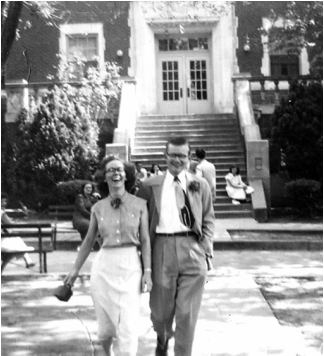 In early 1950’s, the young couple moved to Dallas for Lloyd to begin his training and Margie to continue her career as linotype operators. Back then, this was a trade considered very popular for deaf people. There weren’t too many open doors of employment in those times so in order for Lloyd to receive his International Typographical Union card (ITU), they moved to Munday, one of the Panhandle towns where Bobbie Beth Bridges was born. She is also deaf. When Lloyd finally became a bona fide printer, they moved to Terrell where they began their long careers with the Dallas Times Herald. Around this same time, their son Byron was born and it became Lloyd, Margie, Bobbie, and Byron, an all-deaf family. The acquisition of language, through signed and written languages would be taught constantly because life at that time was a ﻿﻿struggle﻿ for ev﻿ery deaf citizen. During the 1960’s, there was no telecommunications and no communication access such as telephones, or interpreters for deaf people to consult with their doctors or even for courtroom appearances. 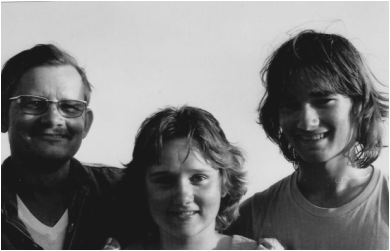 Lloyd and Margie were determined to educate their c﻿hildren because they knew that to be deaf﻿ and successful, one has to climb a mountain whereas a hearing person could just walk up a hill. Deaf people were not granted access to community services readily available for hearing people. Lloyd and Margie saw this injustice and they were determined to change all that. Lloyd and Margie, in tow with two toddlers, joined Hampton Place Baptist Church in Dallas. In that time, the community church served as the center for deaf people. It was there they met individuals such as Jonnie Duncan, Betty Merritt and Mary Conner, all Children of Deaf Adults (CODAs). Lloyd and Margie taught them the nuances of interpreting for church services and eventually they ventured into community services. Betty, Mary, and Jonnie were already immersed with interpreting tasks, not fully aware that the seeds of professional interpreting have been sown. They volunteered their time at the church to learn more on how to interpret. Lloyd and Margie did not stop there as they continued to teach and train many other individuals, who went on to become successful ﻿sign language interpreters﻿. Through their associations with these young interpreters, Lloyd and Margie became involved with the Texas Baptist Conference for the Deaf and the Southern Baptist Conference for the Deaf (SBCD). Lloyd later became president of both organizations. It was because of this leadership opportunity that they were able to organize the first interpreting meeting in Dallas with a group of church interpreters. The purpose of the meeting was to address a real need for a professional organization to begin a listing of sign language interpreters. Also, it was agreed upon to find creative solutions to educate people on the real need for facilitators to ensure that Deaf people receive equal access in courtroom settings (i.e. interpreters). Lloyd and Margie continued to encourage church interpreters to meet again and they expand the circle of interpreters by visiting other churches in Texas to eventually set up an organization called the Texas Society Interpreter for the Deaf (TSID.) These church interpreters throughout Texas were instrumental in organizing and establishing TSID. Eventually, they moved to Irving, Texas joining First Baptist Church and there they met another interpreter by the name of Jim Scoggins. The partnership between Lloyd and Jim changed the course of history for deaf people in Texas. Having Jim as an ally helped to pave the way with his knowledge of business and leadership, which provided a much needed spark of momentum to help get TSID off the ground. The partnership between Jim and Lloyd was astounding, an awesome chemistry … together, they helped to remove many barriers experienced by deaf people in Texas. Through their efforts, the very first Teletype device for the deaf (TTY) in Texas was used between the Scoggins and the Bridges residence. This was the first telephone a deaf person could use in 1970. Pretty soon, more deaf people in Irving and throughout Texas had TTYs, making an inroad toward the goal of equal access. After many discussions with Jim and various individuals, Lloyd felt that while teaching and training interpreters for the deaf was worthwhile, something more was needed. It was time to organize and push for the civil rights of all deaf individuals. Jim and Lloyd made it their mission to educate state legislators on the social injustices facing the deaf. They gathered their legislator’s support in providing local and state services to help ease the challenges experienced by the deaf community. These challenges ranged from educational inferiority to the growing need of social service programs, unemployment and economic hardships. Lloyd and Jim pushed tirelessly for several bills to be introduced to the State legislators in Austin. One bill that passed was for the establishment of the Texas Commission for the Deaf, (HB 1293 in June of 1971) the first commission of its kind America. TCD is now known as the Department of Assistive and Rehabilitative Services, (DARS). A big reason for the successful passage of this bill was due to the great number of deaf people in Irving who were passionate about helping Lloyd and Jim promote deaf rights. Jim provided bus and van rentals, out of his own pockets to make it possible for them to participate in the political process. They would drive down to Austin to meet with their State Representatives and for voting days. They informed legislators of the real need for community services and promoted the idea of more schools for deaf and hard of hearing children. Legislative testimonials were provided and many “one on one” meetings with state legislators were painfully done with pen and paper to ensure that those bills be heard. Governor Smith shaking Lloyd's hand after signing HB 1293, creating the Texas Commission for the Deaf (TCD). United States Congressman Jack Hightower said this of Lloyd, “In every area of life there are always a few dedicated people whose visions and hard work make things happen that improve the quality of life for all. The progress that has been made because of your dedication will continue down through the years.” Texas State Representative John F. Boyle wrote in a letter, “without dedicated and highly competent citizens such as yourself that have devoted their time, talent and efforts to assisting the deaf community I am afraid there would have been no progress at all.” Lloyd Bridges and Jim Scoggins were instrumental in getting HB 1293 passed allowing for the formation the Texas Commission for the Deaf (TCD). Lloyd was also honored in a formal TCD meeting some 25 years ago. It was moved, seconded and passed to name Mr. Lloyd Wayne Bridges as the “Father of the Texas Commission for the Deaf.” His work in getting TCD established will remain as one of his lasting legacies and it would be one of his final gifts to his beloved deaf community. During this time of service, Lloyd was diagnosed with cancer. Lloyd Bridges always wanted the best for his deaf children and he worked to change their world. When asked why he continued to labor while suffering from a debilitating form of cancer, he shared that he was doing this to ensure that community interpreting and educational services will be available for his children and grandchildren. His hope was that those after him would not face the discriminatory experiences that he had gone through. During his many trips to the State Capitol in Austin, legislators gained respect for the man who had such a short time to live. Lloyd continued to work, inspiring others around him. Those State legislators gained first hand experience on how to use sign language interpreters and they gained a greater appreciation on how to communicate with deaf individuals. Lloyd Bridges was a breaker of barriers and with his dear friend Jim; they changed the future for the deaf children that Lloyd loved so much. Lloyd Bridges, despite the progression of his cancer tried to encourage those around him to not to take anything for granted. Even in his last day, he never complained, only encouraging his family to live life with a passion, faith, and for a cause greater than self. His legacy instilled on to his children, both of whom persevered to receive their doctoral degrees. Bobbie and Byron are leaders in their respective fields as Bobbie Beth, like Lloyd continued in her father’s steps as a leader for various civic and social organizations. She has the distinctive honor of being the only person to serve as president of both the USA Deaf Sports Federation and president of the National Association of the Deaf. Byron became a University Professor in the field of sign language interpreting and linguistics. Much like his parents did in the 1960’s, Byron continues to train students to one day become interpreters. He has written articles, books and produced over 30 DVDs in American Sign Language. Byron also provides workshops and trainings to various community organizations and businesses throughout Austin, promoting cultural sensitivity and understanding. Margie Lee Bridges has stayed active in the deaf community after her husband passed. She has also been a big influence in the lives of her grandchildren who affectionately call her “Mamo.” Margie never remarried or even dated as she always stayed true to her one love. Oddly enough, Lloyd’s grandchildren are all hearing but they have been immersed in the deaf world from a young age. The oldest, Kizzie Ann was born just weeks before her grandfather passed away. She worked as a sign language interpreter for several years before falling in love with a handsome deaf Italian man. She now lives in Rome, Italy and she has two sons of whom one is hearing and one is deaf. 3 Bridges was founded in honor of Lloyd Bridges and in the spirit of Jim Scoggins. Both men lived a life of serving others and were always fine with living in the shadows. Both men were such good friends because they humbly deferred to one another. This is our way of paying tribute to the great men and leaders of a movement that pushed the oppressing hand away. Had it not been for their service, sign language interpreting agencies such as our own might not be in existence. The 3 Bridges represents the 3 generations of service to the deaf community. Lloyd and Jim would have been proud.